Kate Middleton on her way to a pharmacy in London on Wednesday. Middleton's outfit frustrated paparazzi eager to photograph her growing baby bump. "Debut" might be a strong word, but Kate Middleton did finally reveal a hint of baby bump to the world this weekend. The British paparazzi caught the Duchess of Cambridge out and about last week, shopping at Boots in West London. Kate was wearing her typical off-duty gear -- skinny pants, suede boots, ponytail -- with one exception: a swingy tartan cape-like jacket from Zara, which cascaded gracefully over what appears to be a visibly pregnant tummy. British tabloids touted the photo as the "first look" at the bump, which means the Royal Bump Watch has officially begun, or something. 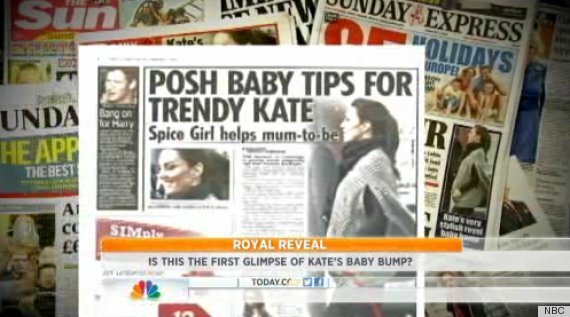 The most famous baby bump in the world - with apologies to Kim Kardashian - surfaced on a rare sojourn in public last week. Let's hope she keeps up the shopping frenzy -- how else will the Royal Bump Watch continue?